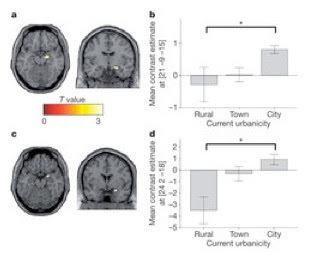 From the journal Nature, German researchers found that city dwellers showed much more social stress (measured by amygdala activation in response to an examiner scolding them as they were doing math problems) than country folk. Lead researcher Meyer-Lindenberg was looking to tease out factors that contribute to a 2-fold higher incidence of schizophrenia in city vs. rural dwellers. The study is a good reminder the importance of environment on psychological health - it seems obvious, when for instance a child is having a psychological crisis in an environment of significant stress, it's surprising how often environmental changes (like take them out of school or a bullying situation?) take a back seat. Studies like this are helpful. Of course, it shouldn't take an fMRI study to tell us that put-downs and city stress are bad for our brains. It should also be common sense. The Nature article is free with registration.